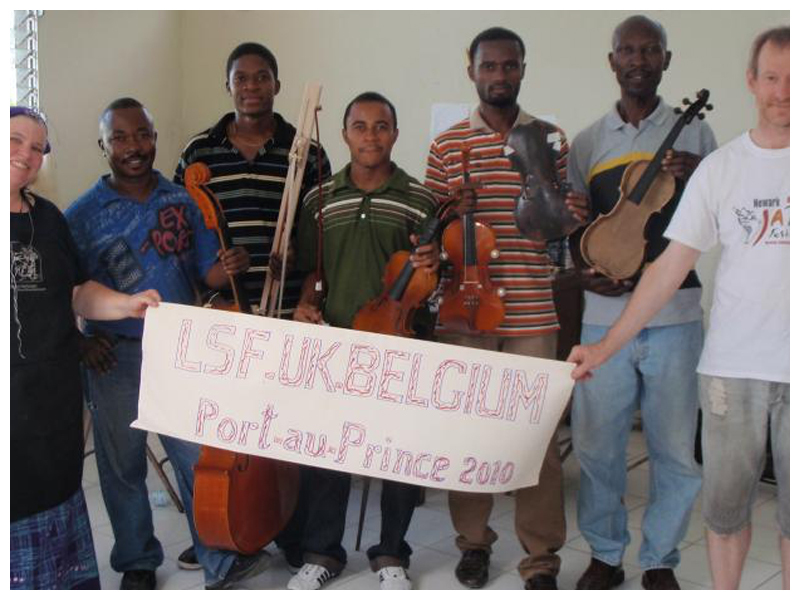 In July 2008, three members of LSF UK spent three weeks in Leogane, Haiti as resident Luthiers of the Summer Camp of St Trinite Music School, Port au Prince. 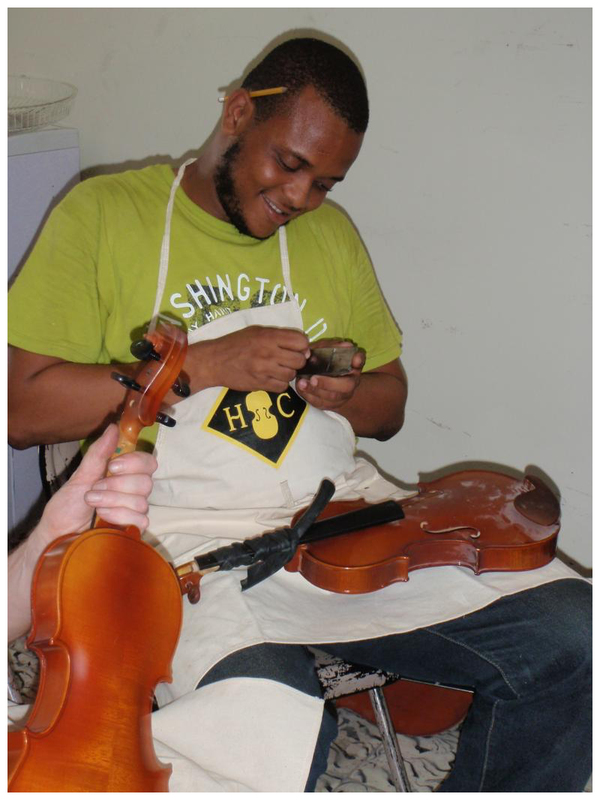 During the camp, six musicians from sites across Haiti were given instruction on basic repair and maintenance of the violin family of instruments. 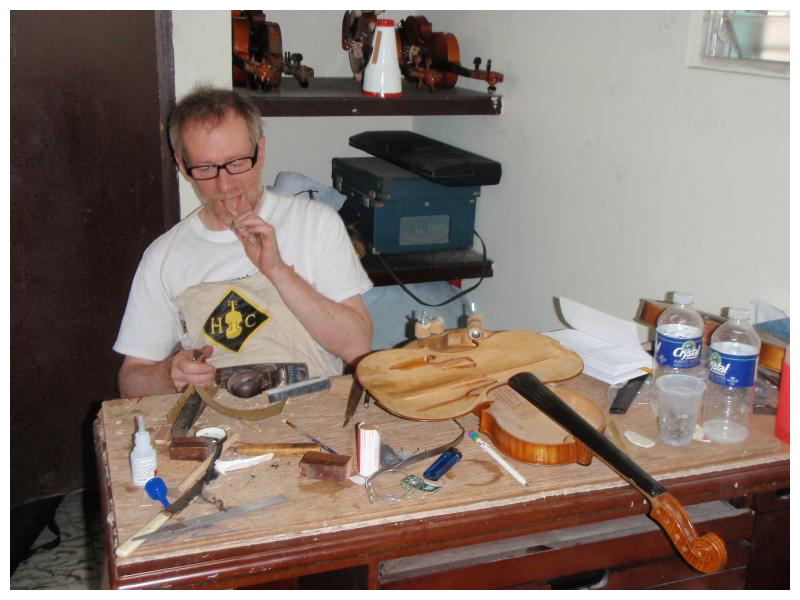 In addition, a large number of instruments were repaired by the Luthiers. The aim of LSF was to return in 2010 to develop this training and to carry out some more complex repairs. St Trinite, founded 40 years ago, was the main music school of Haiti and was based at a complex of buildings in downtown Port au Prince that included a music school, concert hall, day school, trade school and the Episcopalian Cathedral (one of Haiti’s famous buildings). 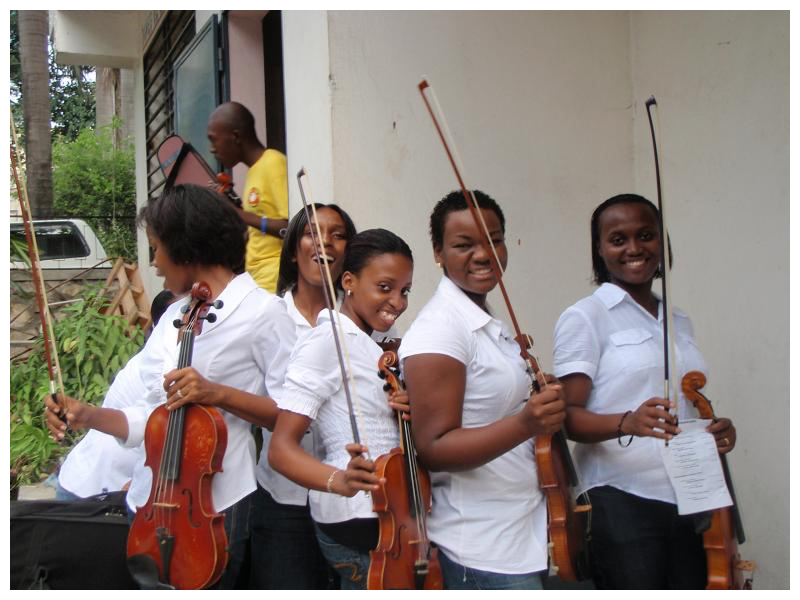 Over 1000 young people received music tuition and participated in numerous orchestras, choirs and music projects. 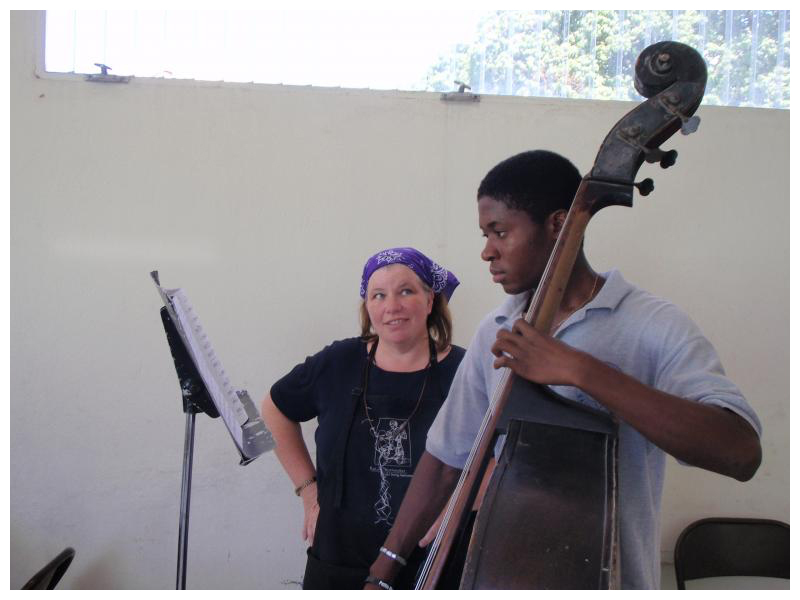 As well as having a highly trained local staff, the School received regular input from many professional musicians with a special interest in Haiti who have, for many years, travelled from the USA to teach at St Trinite and other centres. On January 12th 2010, the whole St Trinite complex was destroyed in the earthquake. The casualties were few at the music school but over 200 people died elsewhere in the complex. Apart from the terrible loss of life, the loss to the Haitian community of this cultural treasure is immense. 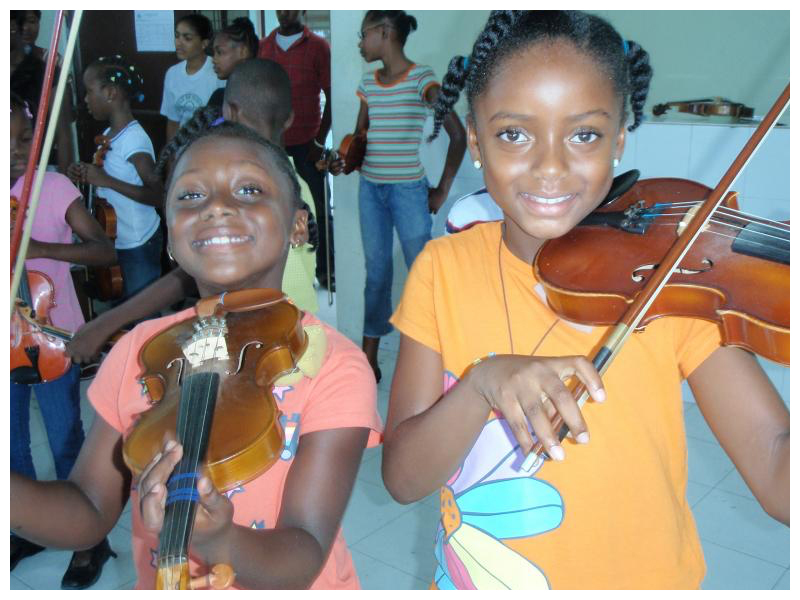 The St Trinite Music School continues to function in improvised buildings at its original site and at its annexe in Petionville, a suburb of Port au Prince which was less affected by the earthquake. It may be difficult to appreciate the relevance of music and Lutherie to a community that has suffered massive trauma only six months ago. The reality, as we observed, is that life continues to go on in as ‘normal’ a way as possible in these extraordinary circumstances. Schools, hospitals and businesses continue to function in improvised buildings with typical Haitian resourcefulness and help from NGOs. After careful discussion with our Haitian and American partners, it was decided that an LSF mission would still be able to provide useful input into the music school as well as provide continuity and much needed encouragement to still came, knowing things would be more difficult than usual. The participants were Robert Cain, Luthier and Lecturer at the School of Violinmaking, Newark College, UK and Anna Huthmaker, Archetier of Huthmaker Violins, Atlanta, USA. Belgian LSF provided 1000 euros of tools for the mission. Seven students aged 18-30, came from four centres across Haiti i.e. Port au Prince, Cap Haitian, Jacmel and Aux Cayes where there are music projects of different sizes. 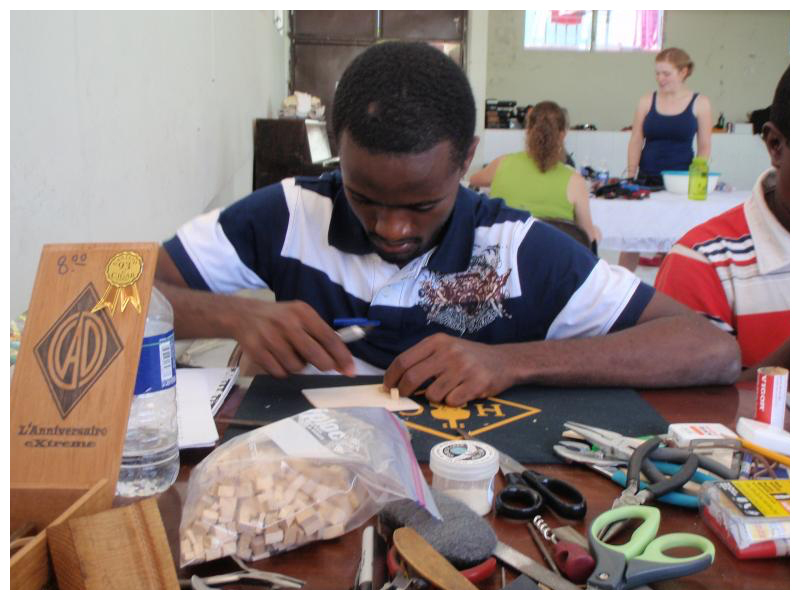 The mission was based at Eglise St Jaques, Petionville, where a room has been set aside for a permanent Atelier. Robert taught half the students set up and basic repair techniques whilst Anna, in another room, taught bow rehairing and repair. We swapped at the half-way point. 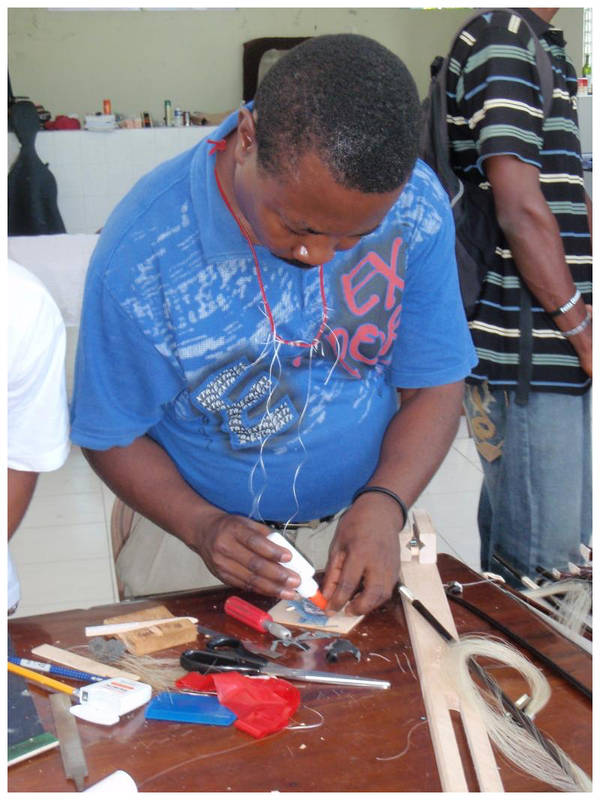 Three of the students had taken part in the 2008 workshop in Leogane and have been doing useful work since. The heat and humidity made for difficult working conditions. Accommodation was Spartan i.e. sleeping on the floor with a mosquito net and a fan. Haitian plumbing is not for the fainthearted! Any discomfort was more than compensated for by the generous, welcoming and appreciative people we lived and worked with. Part of the challenge of any LSF mission is in improvising techniques to suit the local conditions e.g. 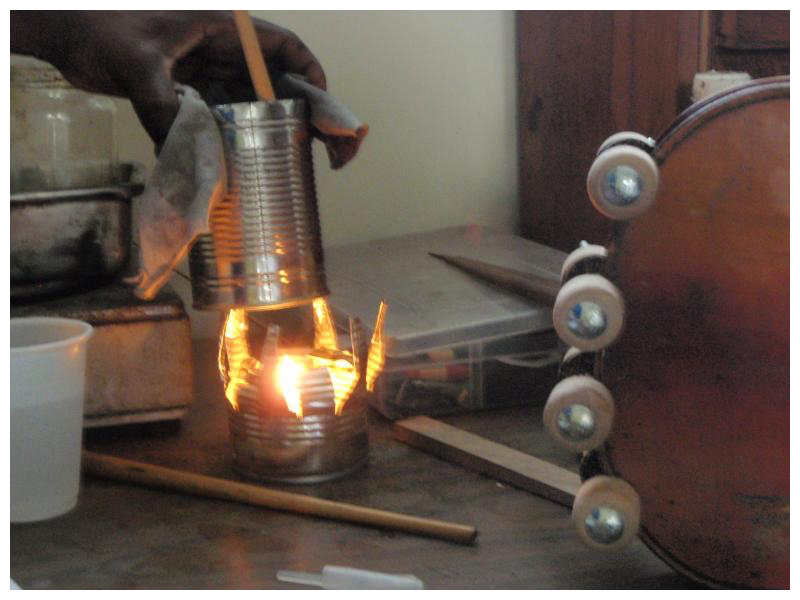 to cope with the erratic electricity supply, Rob had invented a candle powered glue pot made of two tin cans and a jam jar. This was highly successful and could be easily copied by the local Luthiers. It also doubled as a tea pot! What did the Mission cost? The participants raised all of the funds for their own travel and so the net cost to LSF was minimal. By the end of the project, all the students were able to re-hair bows to an acceptable standard. All students had also learned basic bow repairs e.g. faces, lappings etc. All students started to set up a violin i.e. top nut, fingerboard shoot, soundpost, bridge, pegs. 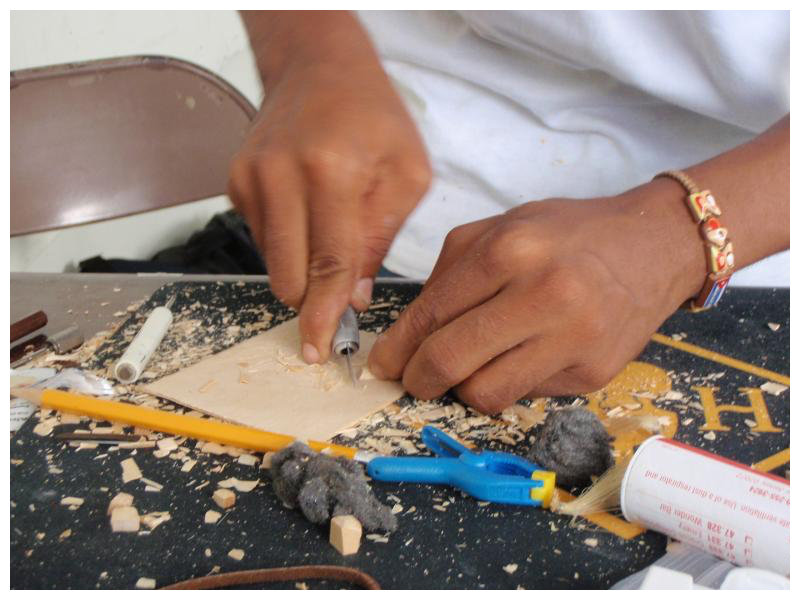 Some students went on to tackle more advanced repairs on instruments damaged in the earthquake. All the students can now play a useful role in maintaining instruments and bows in their respective centres. 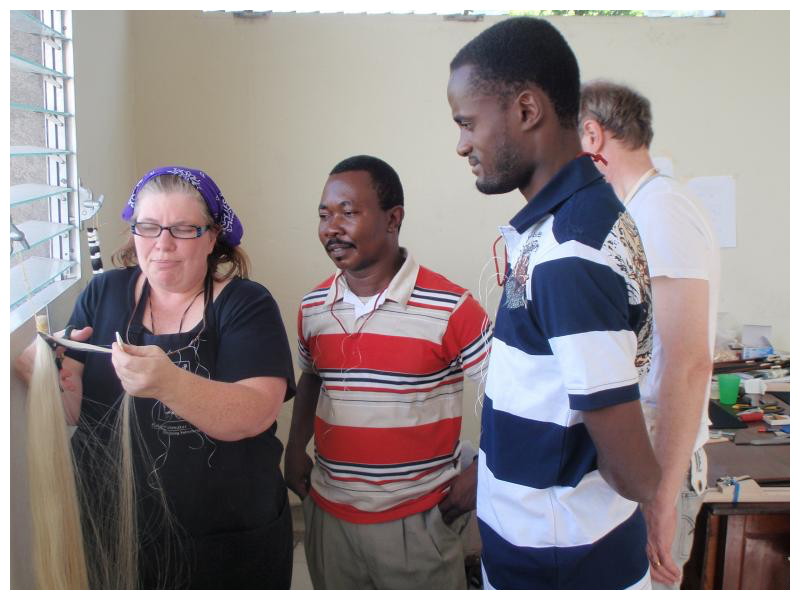 Tools and fittings were distributed between three centres, Port au Prince, Jacmel and Cap Haitian. These will be kept safe and made available to any subsequent LSF mission. The value of these items was approximately 4000 Euros of which, 1000 Euros worth of tools were donated by LSF Belgium. There was great value in LSF repeating this scaled-down version of the 2008 mission. 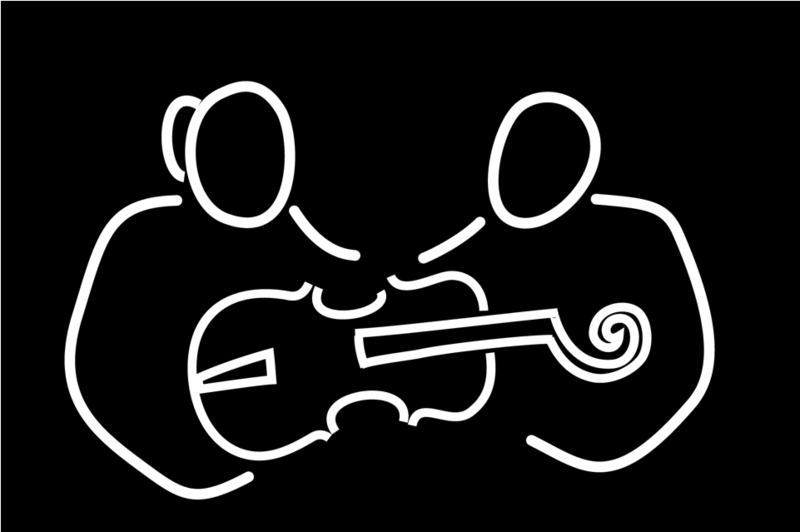 LSF was able to maintain and develop contacts with the local musician-Luthiers and the organisers of the Music School, Pere David Cesar and the Directors of the Summer Camp, John Jost and Janet Anthony.